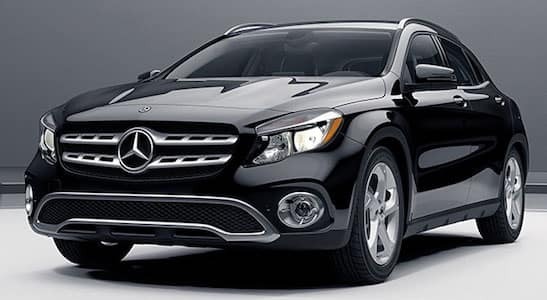 Are you on the hunt for your next Mercedes-Benz luxury sedan, coupe, or SUV? 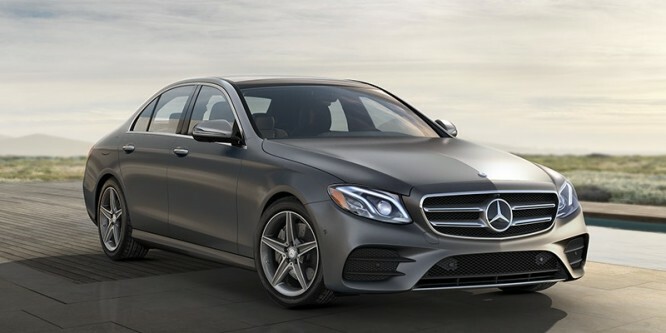 At Autohaus on Edens, we’re the premier Mercedes-Benz dealership in Chicagoland, so we guarantee you’ll find a high-end vehicle that surpasses all of your expectations. Discover the new vehicle special offers below and find the Mercedes-Benz vehicle you’ve had your eye on. Once you’ve spotted the model you desire, explore our vast inventory of new luxury sedans, coupes, or SUVs to find the exact German-engineered model you’d like to test drive. * For qualified customers only. 1.99% APR financing for 72 months at $14.75 per month, per $1,000 financed. Excludes leases and balloon contracts. Available only at participating authorized Mercedes-Benz dealers through Mercedes-Benz Financial Services. Must take delivery of vehicle by April 30, 2019. Specific vehicles are subject to availability and may have to be ordered. Subject to credit approval by lender. Rate applies only to Mercedes-Benz model vehicles listed. 1.99% APR on any eligible New 2019 Mercedes-Benz CLA & GLA Models, exclusions apply. See dealer for details. Dealer will not honor typographical errors in this ad. * Program Eligibility: April 02, 2019 through April 30, 2019. Eligible customers will receive up to 3 months’ payment credit on their current lease with a lease or finance of any eligible new 2018, 2019, or 2020 Mercedes-Benz vehicles through Mercedes-Benz Financial Services. Certain exclusions apply. See dealer for details. 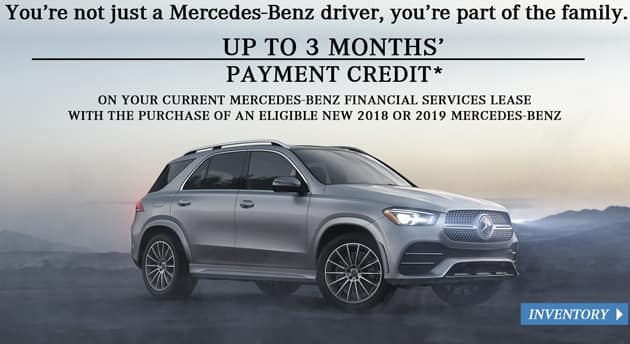 * Available only to qualified customers at participating authorized Mercedes-Benz dealers through Mercedes-Benz Financial through April 30, 2019. Advertised lease rate based on a gross capitalized cost of $36,896. Includes destination charge. Excludes title, taxes, registration, license fees, insurance, dealer prep. and additional options. Total monthly payments equal $12,204. Cash due at signing includes $2,653 capitalized cost reduction, $795 acquisition fee, and first month's lease payment of $339. Total payments equal $15,652. Subject to credit approval. No security deposit required. Mileage allowance of 10k/yr or 30K miles. Dealer will not honor typographical errors in this ad. * Available only to qualified customers at participating authorized Mercedes-Benz dealers through Mercedes-Benz Financial through April 30, 2019. Advertised lease rate based on a gross capitalized cost of $43,876. Includes destination charge. Excludes title, taxes, registration, license fees, insurance, dealer prep. and additional options. Total monthly payments equal $15,804. Cash due at signing includes $3,099 capitalized cost reduction, $795 acquisition fee, and first month's lease payment of $439. Total payments equal $19,698. Subject to credit approval. No security deposit required. Mileage allowance of 10k/yr or 30K miles. Dealer will not honor typographical errors in this ad. * Available only to qualified customers at participating authorized Mercedes-Benz dealers through Mercedes-Benz Financial through April 30, 2019. Advertised lease rate based on a gross capitalized cost of $54,496. Includes destination charge. Excludes title, taxes, registration, license fees, insurance, dealer prep. and additional options. Total monthly payments equal $21,564. Cash due at signing includes $3,619 capitalized cost reduction, $795 acquisition fee, and first month's lease payment of $599. Total payments equal $25,978. Subject to credit approval. No security deposit required. Mileage allowance of 10k/yr or 30K miles. Dealer will not honor typographical errors in this ad. * Available only to qualified customers at participating authorized Mercedes-Benz dealers through Mercedes-Benz Financial through April 30, 2019. Advertised lease rate based on a gross capitalized cost of $37,276. Includes destination charge. Excludes title, taxes, registration, license fees, insurance, dealer prep. and additional options. Total monthly payments equal $14,004. Cash due at signing includes $2,653 capitalized cost reduction, $795 acquisition fee, and first month's lease payment of $389. Total payments equal $17,452. Subject to credit approval. No security deposit required. Mileage allowance of 10k/yr or 30K miles. Dealer will not honor typographical errors in this ad. * Available only to qualified customers at participating authorized Mercedes‑Benz dealers through Mercedes-Benz Financial through April 30, 2019. Advertised lease rate based on a gross capitalized cost of $43,066. Includes destination charge. Excludes title, taxes, registration, license fees, insurance, dealer prep. and additional options. Total monthly payments equal $17,244. Cash due at signing includes $3,099 capitalized cost reduction, $795 acquisition fee, and first month's lease payment of $479. Total payments equal $21,138. Subject to credit approval. No security deposit required. Mileage allowance of 10k/yr or 30K miles. Dealer will not honor typographical errors in this ad. * Available only to qualified customers at participating authorized Mercedes-Benz dealers through Mercedes-Benz Financial through April 30, 2019. Advertised lease rate based on a gross capitalized cost of $58,196. Includes destination charge. Excludes title, taxes, registration, license fees, insurance, dealer prep. and additional options. Total monthly payments equal $22,644. Cash due at signing includes $4,399 capitalized cost reduction, $795 acquisition fee, and first month's lease payment of $629. Total payments equal $27,838. Subject to credit approval. No security deposit required. Mileage allowance of 10k/yr or 30K miles. Dealer will not honor typographical errors in this ad. * Available only to qualified customers at participating authorized Mercedes-Benz dealers through Mercedes-Benz Financial through April 30, 2019. Advertised lease rate based on a gross capitalized cost of $57,753. Includes destination charge. Excludes title, taxes, registration, license fees, insurance, dealer prep. and additional options. Total monthly payments equal $23,724. Cash due at signing includes $3,299 capitalized cost reduction, $795 acquisition fee, and first month's lease payment of $659. Total payments equal $27,818. Subject to credit approval. No security deposit required. Mileage allowance of 10k/yr or 30K miles. Dealer will not honor typographical errors in this ad. * Available only to qualified customers at participating authorized Mercedes-Benz dealers through Mercedes-Benz Financial through April 30, 2019. Advertised lease rate based on a gross capitalized cost of $71,329. Includes destination charge. Excludes title, taxes, registration, license fees, insurance, dealer prep. and additional options. Total monthly payments equal $29,124. Cash due at signing includes $5,209 capitalized cost reduction, $795 acquisition fee, and first month's lease payment of $809. Total payments equal $35,128. Subject to credit approval. No security deposit required. Mileage allowance of 10k/yr or 30K miles. Dealer will not honor typographical errors in this ad. If you have any questions regarding the special offers listed or would like to inquire about scheduling a test drive to our Mercedes-Benz dealership in Northbrook, IL, reach out to our team of product specialists using our contact form or by calling (847) 272-7900.